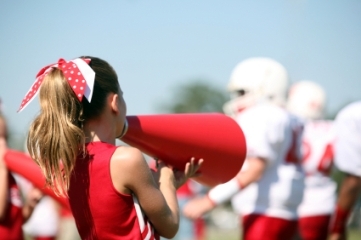 According to a recent survey of 1,016 teen girls conducted by Varsity Brands, cheerleaders are more likely than the average teen girl to volunteer (56% vs. 46%) and join an organization within their school (43% vs. 24%). "While cheerleaders are recognized for spirit-raising activities all year long, they do so much more to benefit their communities and schools," said Nicole Lauchaire, Vice President, Corporate Marketing & Communications at Varsity Brands. Cheerleaders are more likely than the general teen (57% vs. 46%) to hold a leadership position in or out of school; cheerleaders are more likely to be a part of Student Council (33% vs. 25%) and programs connected to the arts than the average teen girl. Ninety-three (93) percent of teen girls participate in one or more activities at school. 65 percent of high school girls participate in a school sport. The top 10 most popular include track and field, soccer, tennis, basketball, volleyball, softball, cross country, swimming, cheerleading, and dance team. A majority say that playing some type of sport/spirit team generally makes them happier (78%), builds their overall confidence (73%) and helps to relieve stress (69%). Varsity's study surveyed 1,016 teen girls ages 13-18 to represent the roughly 14 million teen girls across the United States and sought to find out more about this powerful teen demographic, how they spend their time, how influential they are as a group and where they hold the most power of influence. According to a recent survey, cheerleaders are more likely than the average teen girl to volunteer, join an organization, and take leadership positions in their school.